Nowadays, tablets are growingly becoming a bigger part of people's lives as they increase in popularity. Whatever the reason you may be using your tablet, you don't want it to break, and if it does, you don't want to have to pay a ridiculous amount for a new one or a one off repair. It's also very frustrating to be cut away from the world during this time, as very often you use your tablet to connect with people. Fortunately, at Row.co.uk, we can protect you against any possible issues such as mechanical, electrical or accidental damage, as well as theft and loss**, from £1.49 for amazing tablet insurance! On top of this, when you process a claim with us we aim to get a replacement tablet to you within 24 hours of your claim being accepted, therefore you will be quickly connected back up with everything and everyone. Devoted to your tablet? Well you're not alone. We all love the fact that tablets can be used in places where no man has gone before. The downside? Using your tablet on the move increases the risk of damage, theft or loss, so loving your tablet involves protecting it! Thieves love shiny things that are easy to run with, don't you?! We offer great value insurance cover for your tablet or iPad. You'll benefit from complete protection against accidental, electrical and mechanical damage at a competitive price. 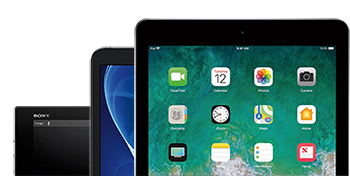 Starting at only £3.49 a month for iPad insurance and from £1.49 for other tablet insurance, plus theft and loss cover can be added for just £2 a month. You'll even benefit from 5% off the price if you have already insured a phone with us, or you could even get a MAHOOSIVE 20% OFF if you cover four or more gadgets on an annual basis with us! Why? Because we're awesome. We provide complete protection against accidental, electrical and mechanical damage and lost, theft & unauthorised calls** at an unbeatable cost, we've got you covered. Our tablet insurance has many fantastic advantages to it, including, 24 hour replacement after a successful claim. You are also able to make multiple claims each year ^, as if that wasn't enough to convince you our customers rate us for our consistently excellent service on Reviews.co.uk. Many tablet insurance companies sign you up and then pass you to a third party and forget about you. Well, we don't agree with that, we like to keep our customers close so we can personally deal with our claims, that way we can be as quick as possible in process the claim and getting you and your beloved tablet back together. We have a quick and simple way of managing claims, and that's online, that's right we are down with the tech savvy kids, if anything happens to your tablet submit a claim online anytime! If your tablet lost or stolen we'll dispatch a replacement as quick as a flash, we aim to have it with you within 1 working day upon approval of your claim.